Due Date: March 10, 2018 <---- This has already been changed once and could very well change again. Baby is still measuring almost 2 weeks ahead of schedule. Baby is the size of: an Avocado (yum!) - Baby can now hear voices and sounds thanks to the tiny bones forming in his ears. He is also growing eyelashes, eyebrows, and hair (although if he is anything like his sister, that head of his won't have much hair on it for a while! haha). Name: WE HAVE A NAME!!! Our sweet baby boy will be named Tucker Donald Sparks. His name carries significant family history, just like his sister's name. I have a post planned for this week that talks all about it. Symptoms: The headaches have eased up, thank goodness! My energy is back and the nausea is gone, so mama is feeling good over here. Last week I did experience something that was basically my body telling my to stop overdoing it. I'm so used to flipping Charlie Beth around at gymnastics class and lifting and carrying her everywhere. She's every bit of 30 lbs, so I know I need to take it easy and let her coach take over all the gymnastics flipping. Weight Gain: Up 2 lbs from pre-pregnancy weight. Movement: Yessss!!! I've started feeling him move, and my heart melts each time I feel a little flutter. This is by far my favorite thing about pregnancy. Cravings/Aversions: Mozzarella sticks and cold, crisp salads preferably from a salad bar. I normally hate any type of "buffet," so this is a super strange craving. Pregnancy is weird. Missing anything: Wine and Sushi still sound delicious. A cold beer while watching football on Saturdays also sounds pretty darn good. Sleep: Charlie Beth must be going through some kind of developmental leap because last week she started waking up once a night. Most nights I can go in and rock her back to sleep. Last Saturday night, however, we ended up bringing her into our room and having a little party at midnight. She was up for a couple of hours. Thankfully this week she seems to be back to her normal sleep patterns. 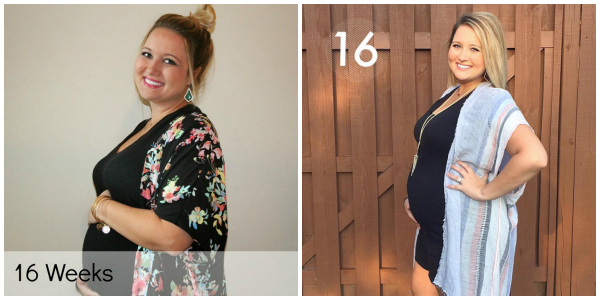 Maternity Clothes: My mom and I went shopping on Friday and I lucked out in Macy's on maternity clothes. Their maternity section is tiny, but I managed to find a ton of stuff. I should be set for a while on clothes (Thanks, mom). Nursery: I have a theme picked out for the nursery! I'll start working on it in a few months, but the vision in my head is absolutely perfect. Best moment this week: My mom and I took Charlie Beth to see Disney on Ice last week and she absolutely LOVED it. I loved watching the show through her eyes. Looking forward to: Feeling these movements and kicks get stronger and stronger. Husband Is: Excited to experience having a daughter and a son. Looking good mama! So much good news this week! A name, no more headaches, mama feeling good! Cant wait to hear about your plans for the nursery. You will have to share the deets with us at lunch on Friday!!! Disney on Ice is one of my favorite things to do every year. Chris always springs for front row tickets and we have a blast. Funny, the year we finally have a kid...we decided not to go LOL. We want to wait until Zoe is a little older....so next year we are back at it! I love that you guys got to go! Awe so cute- I love the name Tucker too! 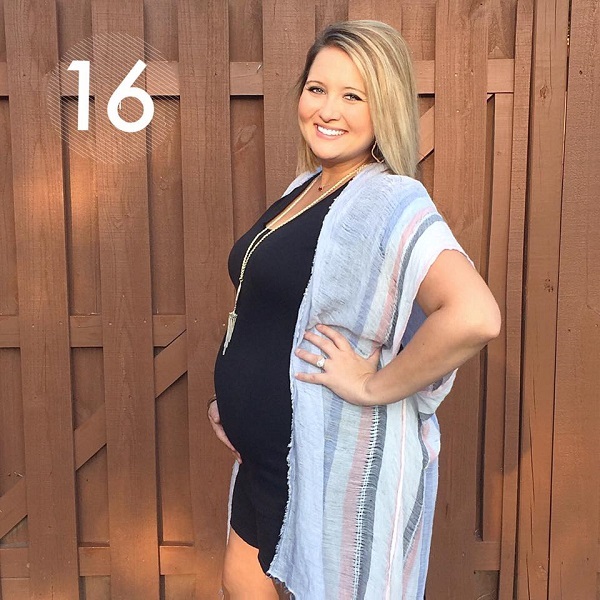 Headaches are the worst so I'm glad yours are gone--and yes pregnancy is so weird...so many changes and different things! I'm going to miss feeling baby move and kick-it's so great. Pregnancy IS so weird! This week, I have been eating salads for lunch. Like what pregnant person just eats a salad for lunch? I can't wait to hear about your plans for the nursery!!! These posts are dangerous! I remember wanting to be pregnant when you were with your first. Now I'm thinking about baby #2 as you're pregnant with your second! Hmmmm... haha. I'm so interested to hear how you feel differently this time around. More confident? It seems like time is flying!! It's all so exciting, you look so great and I'm glad you're feeling better!